World-travelled throughout my varied careers, I draw on my experiences with unique environments and diverse cultures. My novel, The Girl With the Pendant Pearl, from which many of the recipes in this cookbook are taken, is a mystery/ romance in the milieu of a French Quarter courtyard restaurant - a voyage through familiar surrounds. An author, chef, and musician, I currently divide my time between Louisiana and Florida. Cajun and Creole Recipes from scenes in The Girl With the Pendant Pearl is a nonfiction regional cooking and food book written by James Pumpelly. The Girl With the Pendant Pearl is a romantic novel of suspense set in the French Quarter of New Orleans. The author wrote this cookbook in response to readers’ requests for the recipes described in his novel. Pumpelly begins his work with an historical look at Louisiana cuisine. He describes how the Creoles, who were French and settled the area in the 1700s, adapted their cuisine to the available foods and resources of their new land. The Acadians, or Cajuns, came south from Canada, with their own distinctive cooking styles. The two influences mingled and merged over the years, resulting in the distinctive flair of Louisiana cuisine. Pumpelly includes desserts and other dishes specifically mentioned in his novel, such as French bread pudding with warm bourbon sauce and Coffee-Steen’s-pecan coated bacon and Cajun crab cakes. Each recipe includes a complete listing of ingredients, detailed instructions and a full color photograph of the finished item. Pumpelly provides humorous interludes, entitled Cajun Humor, throughout his cookbook, as well as giving the historical background of various dishes, such as his piece on the Origin of Eggs Benedict. I enjoy cooking and love Louisiana cuisine, so James Pumpelly had me instantly conjuring up fabulous, mouth-watering dishes in my imagination. While sometimes the reality is not quite as spectacular as what’s anticipated, Pumpelly’s range of rich and decadent dishes far exceeded what my paltry imagination had dreamed up. These recipes are incredible! The ingredients are all relatively easy to get, and most of the recipes require a moderate amount of ingredients and moderate time requirements for preparation. After loving the Crawfish in Cajun Cream that my favorite Cajun restaurant used to offer, I was thrilled to learn how to make Cajun Cream for myself. Just about every recipe in this collection is on my must-try list -- literally. Some, I’ll try soonest, such as the French bread pudding and Coffee-Steen’s-pecan coated bacon, but the decision on where to begin is not an easy one. While reading this book, I started planning a culinary adventure to New Orleans, but I’m not waiting until then to begin cooking and eating Louisiana cuisine. Cajun and Creole Recipes from scenes in The Girl With the Pendant Pearl is most highly recommended. If you like blending romance, culture, and good food, try tossing in the spice of Louisiana with James Pumpelly’s The Girl With the Pendant Pearl: Cajun and Creole Recipes. This “cookbook and more” is based on a romance novel which is set in the French Quarter of New Orleans and includes chef protagonists who bring appetizing Cajun, Creole, Italian, and other dishes to the table. The cookbook includes over fifty recipes, many of which are in the novel, interlaced with short articles on a variety of interesting cultural or historical topics, as well as tidbits of Cajun humor. The recipes are illustrated with palate-tempting photographs and are accompanied by instructions that are understandable by novice cooks. Several of the articles are illustrated as well. In The Girl With the Pendant Pearl: Cajun and Creole Recipes, Pumpelly provides an insight into Louisiana culture and food in an entertaining mix that will satisfy your taste buds as well as your intellect and sense of humor. The recipes include delectable appetizers, main dishes, side dishes, sauces, beverages, and scrumptious desserts. The intermixing of some recipes from Italian and other cuisines appeals to the modern palate. Readers will appreciate the focus on fresh and traditional ingredients. I can’t wait to try the Shrimp, Crawfish, and Andouille Pasta with Cajun Cream Sauce, the Shrimp and Corn Chowder, and the Louisiana Fig Cake with Butter Cream Frosting. This a useful book for any cook who appreciates the finer points of regional cuisine. Even someone who doesn’t cook can gain an appreciation of Cajun and Creole culture from this excellent collection. The Girl With the Pendant Pearl: Cajun and Creole Recipes by James Pumpelly is not your average cookbook! Quite the contrary. 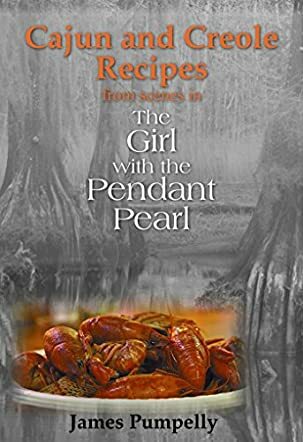 It is a delectable combination of recipes, historical background, and Cajun humor, and complements a novel by the author entitled The Girl With the Pendant Pearl. It is everything we could wish a cookbook to be: excellent and easy to follow recipes, exoticism, but it is also entertaining, fascinating and fun to read. I chose to read The Girl With the Pendant Pearl: Cajun and Creole Recipes by James Pumpelly because the idea of a multi-dimensional cookbook interested me. I love learning about anything, as long as the author knows how to tell a tale or how to share valuable information and that is precisely what James Pumpelly does. I was not disappointed in this amazing and original cookbook. The recipes sound delicious and are easy to follow, some made me dream such as “Alligator Bites”, and all made me want to visit Louisiana. I also enjoyed the history behind the scenes: all these details make the book even more appetizing! What is more, fun is always nearby; the Cajun humor parts are fabulous and give us an idea of what it is to visit Louisiana with a transcription of the accent and of the wit. My favorite one was the last one, in which Clotille subtly threatens her beloved husband. All in all, I loved this book and intend to check out the corresponding novel. That is why I warmly recommend this delightful cookbook.